Here are some photos of a tiny church in Devon. The tour of the church was given to myself and the rest of the class on the Maryvale's Art Beauty and Inspiration course that was taking place at Buckfast Abbey in Devon. 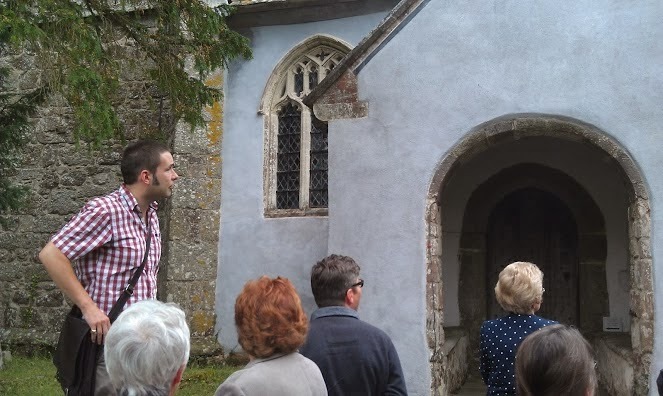 As part of this, we asked Michael Vian Clark, who taught chant to the monks at the abbey, and who is a keen local historian to talk to us about one of the local churches. 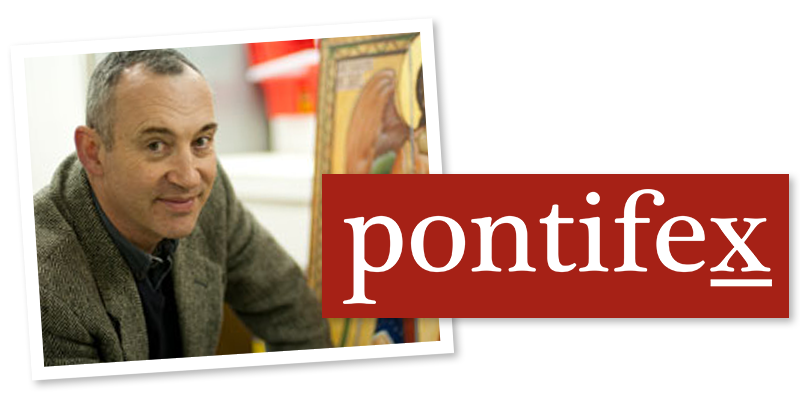 He is now based in Rome where has has recently begun his studies as a seminarian (for the Diocese of Plymouth). 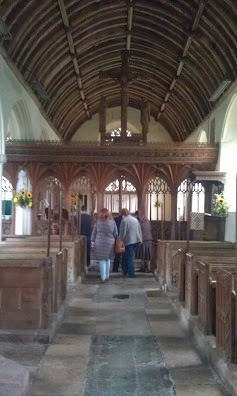 Michael is a keen student of the Sarum Rite and chanted for us in the church (teaching us to accompany him with an organum drone) as he explained how this was the music that would have resonated throughout this church prior to the reformation. Michael has written a description for NLM readers, which I give below. There are some aspects of this that particularly strike me. When Fr Lang of the London Oratory spoke about church architecture this summer at Sacra Liturgia 2013 in Rome, he stressed the importance of thresholds that clearly separate the temple, the place of worship from the outside world. The porch or the cloister, in grander churches, become especially important in this respect in churches that are designed for the Sarum Rite. 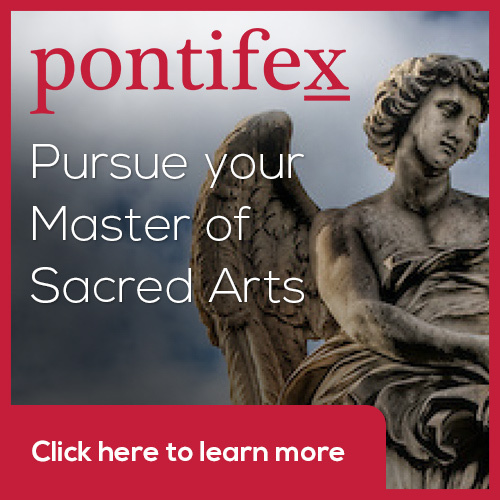 This rite has many processions that emphasise the earthly pilgrimage from the City of Man to the City of God. 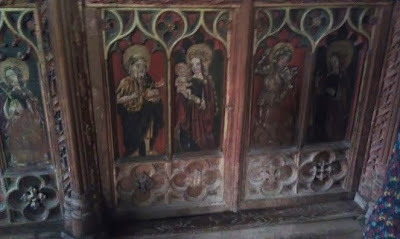 This point of pilgrimage by which even in this life we can by degrees be transformed and participate in the divine nature through participation in the sacred liturgy, is a feature of gothic art, which stylistically spans the divide between the shadowy fallen world of the baroque; and the heavenly state of eschatological man as revealed by the icon. As Jean Corbon describes in his book the Wellspring of Worship, by being part of the mystical body of Christ, his Church, we can participate in the transfigured Light. 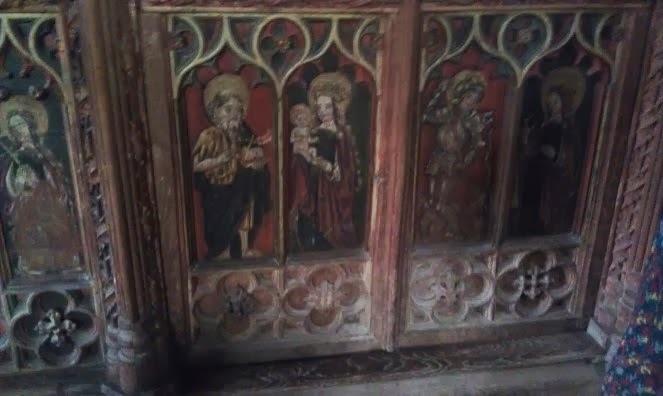 These painting probably survived because the church is so remote and there would have been strong local sentiment to keep them. 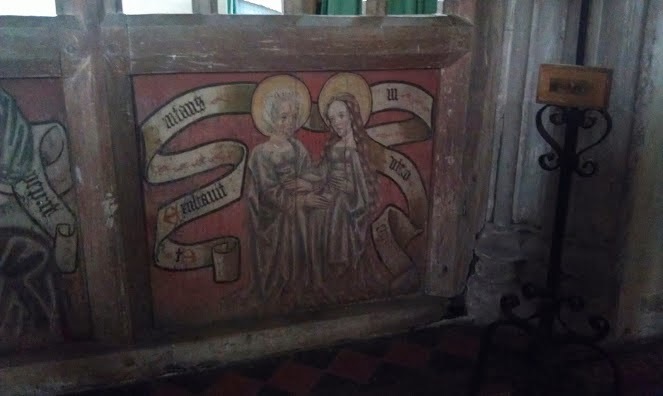 There is a pale fresco on the wall which was revealed when a painting that had previously hung on that section of the wall for centuries was removed. 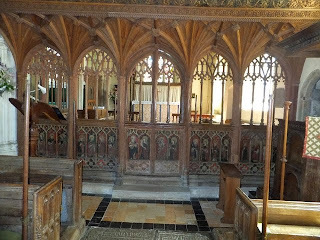 What we see here is an indication of just how colourful and ornate even a small country church would have been during the period when this gothic church, in the English perpendicular style, though very simplified, was built. 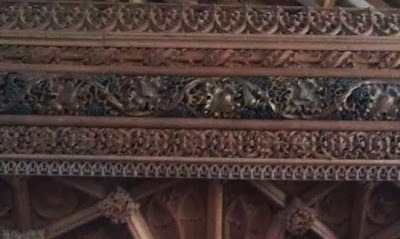 There is an ornate rude screen. The floor, which immediately caught my eye because of its geometric patterned form is probably a Victorian renovation, Michael told me. 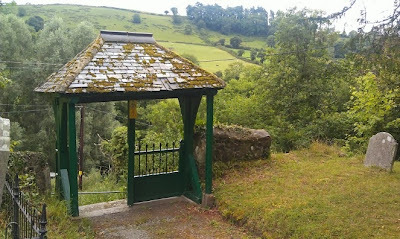 ''The Church of St John the Baptist is dramatically situated on a rocky outcrop overlooking the Teign Valley in Devon, England. It was, and still is, quite remote: accessible only by high-sided lanes. 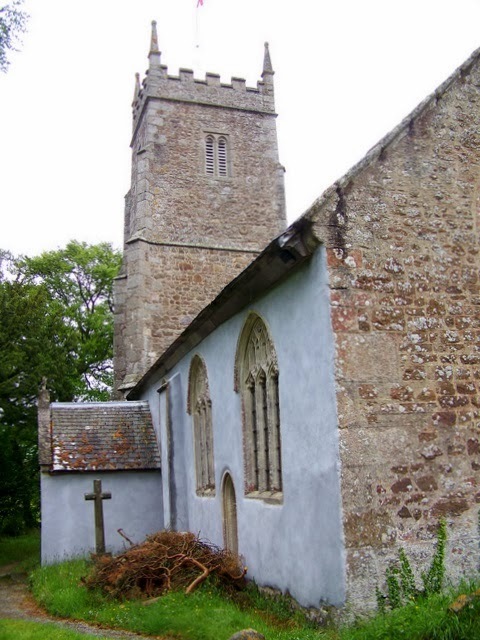 It is part of a family of churches in this valley that share similar architectural features: one may reasonably speculate the hand of the same masons, carpenters and glass painters. 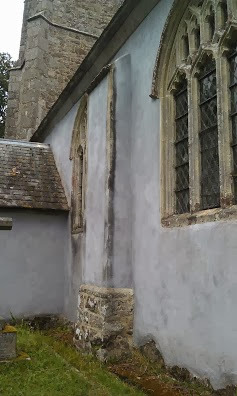 'Like so many Devonian churches, the details (that is to say the window tracery, screenwork and fragments of painted glass) are generally of the late fourteenth to early fifteenth century, but at Ashton, as elsewhere, this disguises much more ancient fabric into which such details were inserted as part of a widespread programme of enhancement and beautification of liturgical spaces right up to the Reformation. 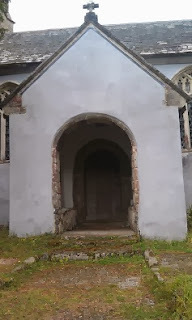 The most striking addition to the typical dual-cell structure of a post-Conquest church is the North aisle, separate by slender and elegant Beer stone arcades that may derive inspiration from the late thirteenth century design of Exeter Cathedral. 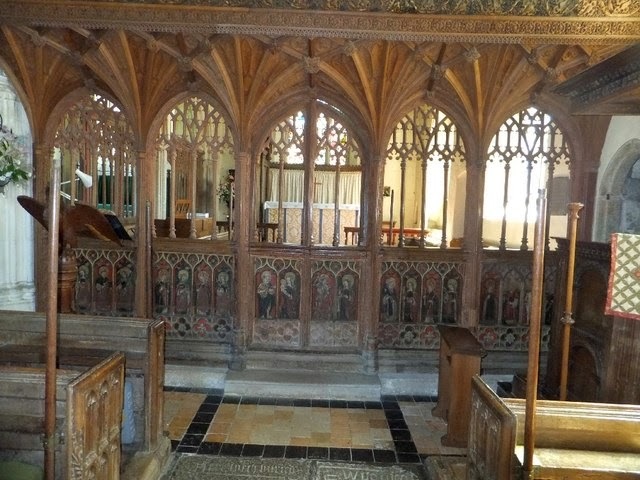 This aisle was built to house a secondary altar, the sanctuary of which later became the 'family pew' of the Chudleigh family, giving a strong clue as to its original benefactors. 'Later, a porch was also added - a feature that had particular significance in the Ritual of the Use of Sarum, [as mentioned]. 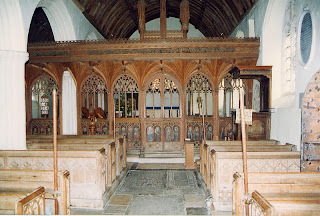 The glory of Ashton is no doubt the beautifully preserved Rood Screen and Parclose Screen that respectively separate Nave from Chancel and the two altars one from the other. 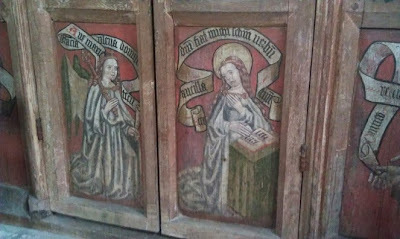 Rood Screens were a particularly favoured devotional expression in England as a consequence of the division of legal responsibility for the Church fabric itself: Chancels were the responsibility of the Living whereas Naves were the responsibility of the Parish. 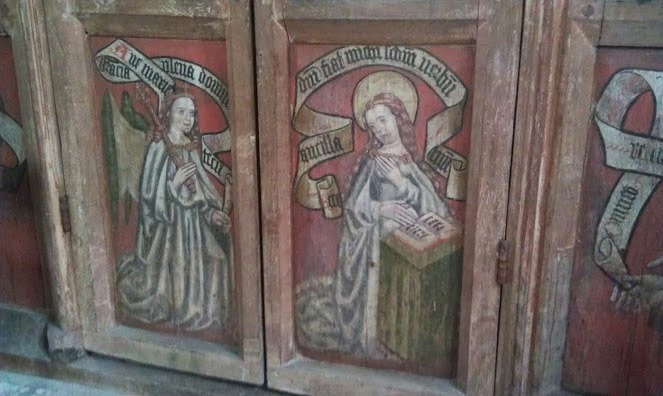 'The Rood Screen marked the boundary and parishes are known to have been anxious to ensure their screen and Rood were as impressive as possible (and more impressive than their neighbours.) 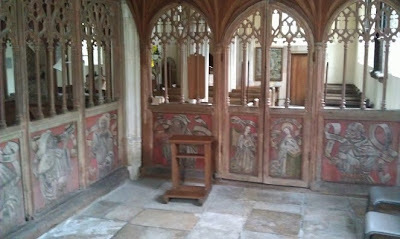 Typically a Screen has three components: a Dado with images of the Saints; Tracery work that permits a view of the High Altar and above this a Loft which gave access to the Rood itself (composed of a large image of the Crucified Lord flanked either side by His Mother and the Beloved Disciple) which was the dominating feature of the people's part of the Church. 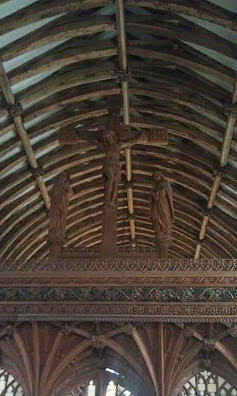 'At Ashton the Screen was sensitively restored by Harry Hems of Exeter in the early twentieth century and the Rood itself has been restored, albeit in unpainted wood. The image sequence is a mixture of the local and universal and sometimes grouped in logical sequence - e.g. Doctors, Evangelists, Martyrs, Holy Helpers; sometimes not. 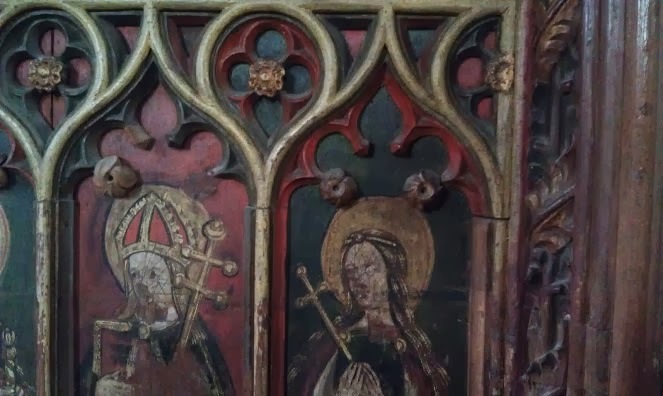 An interesting feature is that of local saint, Sativola or Sidwell who features with the scythe of her martyrdom both on the screen and in glass at Ashton, demonstrating the strength of her cult in the former diocese of Exeter. The connections with mainstream (and very Roman) Catholicism are also clear: here are depicted Popes, Cardinals, Bishops and international saints, such as Zita of Lucca and Anthony of Egypt as well as saints such as Ursula and, possibly Thomas of Canterbury and Boniface that connected Britain with Continental Europe. 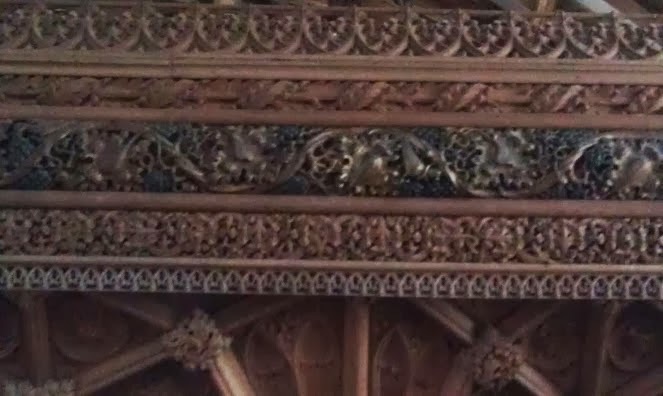 In this view down the ailse, the second altar Michael refers to is just barely visible to the left, we seen the section inside that portion of the screen later on. This is the area at the front of the church that contains the second altar. 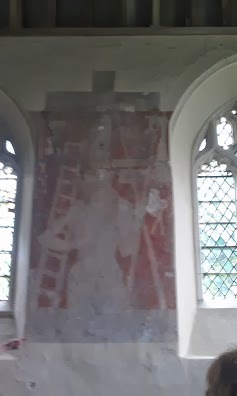 The fresco below was revealed when a more recent wall hanging was removed.